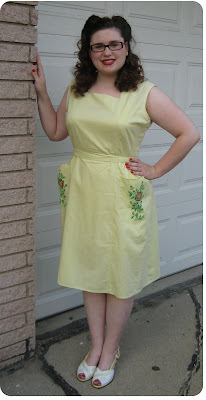 livin vintage: I Love Yellow! Have I ever mentioned that yellow is my favorite color? I just love how bright and cheery it is. Putting on something yellow always brighten my day and puts me in a good mood. I got this dress a while back for a major steal on eBay, but had been putting off wearing it since I am not a huge fan of sleeveless tops and dresses. The hot Michigan weather convinced me to let go of my sleeveless fears and be a little bit cooler. I am still working on getting down victory rolls. I fear I might never be able to really do them correctly. I have been watching Ashley's videos on how to do a victory roll, and they have been helping. Hopefully I will someday be able to do them with ease. I adore yellow too, this is a super lovely dress. Yellow is one of my favourite colours, it's so cheery and happy! This dress is gorgeous, and really suits you. I am also struggling with victory rolls, it's so infuriating sometimes! Keep up with it though, I'm sure you'll get there very soon! you look so pretty in that dress. yellow is a lovely color on you. your hair is divine.